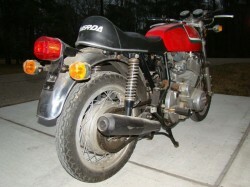 This bike’s in a bit rougher shape than we usually feature here, but I had to post it for two reasons. 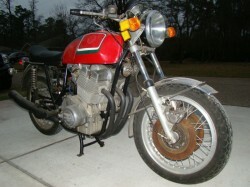 One: it’s certainly a rare, classic sport bike for sale. 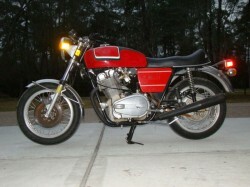 Two: I have this on my very short list of bikes to own. 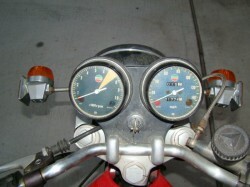 While not quite as reliable as the earlier twins, the triples were well built and durable bikes with few problems. The 3C is a somewhat forgotten Laverda, not quite as classic as the earlier parallel twins, and completely overshadowed by the famous, and usually very orange Jota. 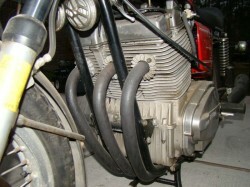 The Jota was basically a hot-rod version of the 3C developed in by Slater Laverda in England and introduced in 1976. It had hotter camshafts and more compression, was good for 90hp, and 140mph. But it ran poorly under 3000rpm and didn’t really its stride until 6500rpm. 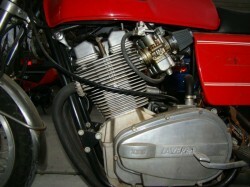 Basically, while the Jotas are the collectable Laverda triples, the 3C’s are the ones to actually ride. You are wise to have the 3C on your shortlist. They are beautiful to look at and fun to ride with plenty of grunt and a unique sound. The vibes really are not bad below 5000 RPM either. Many value them higher than Jotas for the Borrani rims and huge rear drum brake. The huge 200mm headlight doesn’t hurt either. Laverda triples are monstrously undervalued vs. Ducati bevels – for now. They are quicker, better built, and far more durable. And yes, I own both.